This post is a result of recent events with one of the companies that I work with. Sometimes, I help people because I want, sometimes because they pay me, mostly both ;). This time I’ve been helping one company decide on how to outsource their software development. They have many applications, some of them are old, some of them are younger, they constantly build something new as well – a never-ending story. I didn’t want to get into the sole “picking the right company” part of this deal. I was not responsible for financial or any other non-programming part of this process, so instead of recommending companies I focused on something else: How to ensure the same (or better) quality, without having a dedicated team working close to all other people related to a given project. No one really cares! As long as it works, why would they? Programmers didn’t have enough time (and sometimes knowledge), project managers didn’t care as long as it worked (or also didn’t know how to measure things like that), CEO thought that since there are so many apps, it is impossible to do this without a big overhead (and that this would cost a lot of money). I can understand why CEOs can think like that. What I don’t understand is why project managers and CTOs don’t explain this to them. If CEO doesn’t care, no one will be able to. And this will turn against everyone one day. Many poorly written projects are hard to give away. The more complicated they are, the more price grows. Quality always costs. There’s no doubt about that. But if you ensure it from the beginning, the further you go with your project the more you will gain. And I’m not talking only about money. Keep in mind, that people don’t like other peoples code. And working with poorly written code is what they hate. 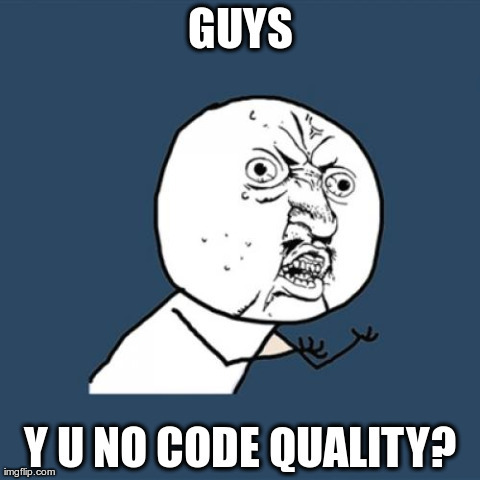 Low quality equals a much higher rotation rate in teams that have to work with such code. Also keep in mind that everything changes. Programmers change their jobs, some companies are being closed, some are being created, and if you want to outsource stuff, you need to always be aware of that. The only thing that should not change from your perspective is your code quality. Outsourcing is not easy. Your team needs to transfer all the know-how to some other places and people. The more code there is, the harder it gets. But what could you do to make it go faster, easier and cheaper? You could ensure some code and documentation standards across all the firms that will work on your software. That way you can diversify across few that will be able to work with others code. If all of them share same principals, their work quality should be similar, their code should be readable for all of them and you could rotate across those companies according to your business needs. Further more you could even specify in the contract what you expect and what they need to obtain in terms of quality. Programmers will still make mistakes, things will still not work the way you wanted but even then standards will allow other people to fix those issues without any unexpected impact on the whole project. If you set the standards, programmers will have a bit less freedom in how they work and what they do. It’s not always good but it is one of those nonfinancial costs you need to take. This is quite obvious. Tests are must be for any application that we want to maintain. Working with not tested software can be a nightmare. But how to measure tests/specs quality? We could (and we should!) use Simplecov. SimpleCov is a code coverage analysis tool for Ruby. It will show you any flaws of your test suites. Not tested classes, methods, cases. 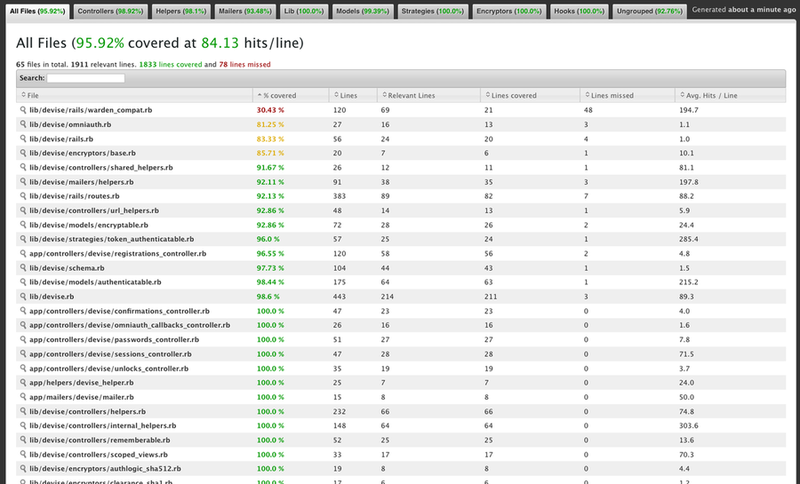 It will also generate some useful statistics. If you require usage of this library from your contractors, you can include coverage level as one of parts of your contract. That way they will be obligated to keep tests up and running all the time. Of course they will have to agree on that, because if you force them to use it, they may just write tests that will “pass” Simplecov statistics, delivering you green, low quality tests/specs. Then it is quite clear that in file credit_card.rb some elements are undocumented and that developers should update docs. As you can see, YARD allows us to easily measure and monitor comments quality. RuboCop is a Ruby static code analyzer. Out of the box it will enforce many of the guidelines outlined in the community Ruby Style Guide. So, instead of having code written in many ways, you can define a file called .rubocop that will contain all the rules about Ruby code style. That way, you can ensure same standards across many applications/dev teams/companies. It will notify you if anything is not as it should be. Code quality is really important. It’s also a topic for more than a blog post, but I hope you will consider this article useful. Tools that I’ve presented won’t replace good developers but they can help you out omit troubles. If you use them wisely, you can ensure similar code quality in many dev teams.